The Heavy Duty Shootout: GM vs. Ford vs. Dodge, who ya got? PickupTrucks.com recently held their Heavy-Duty Shootout, pitting some trucks from Detroits Big 3 against eachother in a number of comparison tests. 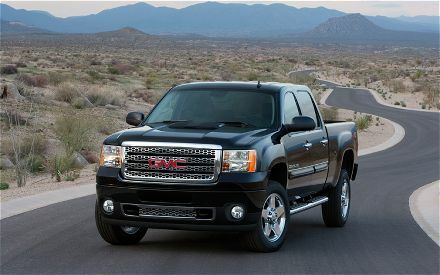 The trucks tested included a 3/4 ton gas, 3/4 ton diesel, and 1-ton diesel dually from each manufacturer for a total of nine trucks – GM sent a 3/4 ton gas Silverado, a 3/4 ton diesel Silverado, and a 1-ton GMC Sierra Denali dually to do battle with the best from Ford and Dodge. The Denali dually blew away the competition (and was therefore named Best 1-ton DRW) which was great to see, but I’ll focus on the Disel 3/4 ton trucks as they are the most popular trucks around here. If you want to see full results, head over to PickupTrucks.com for some very, very indepth analysis. That’s only a few of the tests they ran on the trucks, head over to PickupTrucks.com for the full run down, but as you can see the new trucks from Detroits Big Three are all fairly evenly matched. PickupTrucks gave the nod to the GM, but we’d like to hear what everyone else thinks about the new trucks so get out there, take a couple for a drive, and let’s hear what you’ve got to say!